sew? i knit! : With a lime green zipper! With a lime green zipper! Here is my finished project, just on time. 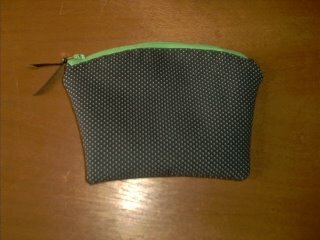 Since I was hand sewing it, I picked a small pouch from the book Made for Travel by Mary Mulari. I was looking for a use for some lime green zippers I got at the thrift store, and I love the way this one looks with this fabric. To read a little more about my project, you can visit me here. 2 out of 3 'aint bad. All done and lovin' it! Hi from Queensland! And finished bag #1!! !